Butter flat to medium chop and small waves. A great looking board! the topside is great, but its the underside where it gets really interesting! It's channeled from head to toe, with edge ridges, a sharp double central concave and lots of ridges on the tips too (see the photo's below). 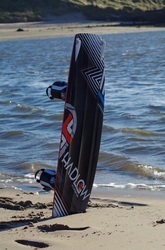 The deck itself is impressively light, but the weight adds up once you put fins and bindings on, but still nothing to be concerned about. The fins are the same as those used on the Hadlow freestyle board, which are larger in size than those supplied on the original edition of the Hadlow wakestyle. The board has been beefed up this year with extra reinforcements on the inserts, embedding them in hardwood sandwiched in carbon. 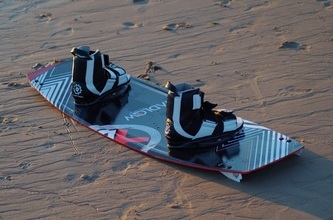 The board feels tough and should live up to the performance demanded of it. Once you get up and riding the stiffness of the board becomes immediately apparent. 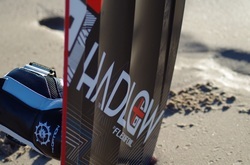 The rocker keeps the tips well clear of the chop and spray out of your face; yet doesn't feel sluggish off the mark as the width gives it plenty of planing area to bring its bottom end on par with most regular twin tips. The Hadlow flies along in straight line with great stability, cutting through the chop with ease. Despite its straight line stability it still remains very easy to spin on the water provided its flattened off sufficiently. The excellent grip of the Hadlow allows it to excel in its upwind performance and despite marginal winds on the second test day it was never an issue to gain upwind ground - a really important feature when you're using boots, as you don't want to be walking up the beach all the time! When you start trying some freestyle, the Hadlow really shines. 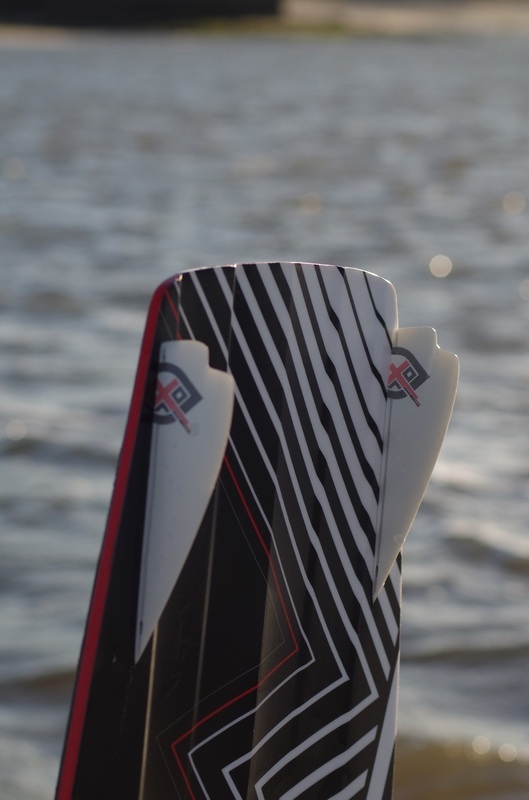 There's an immense amount of grip produced by the channels and fins which allow you to edge super hard against the kite for both hooked in boosting or unhooked pop. 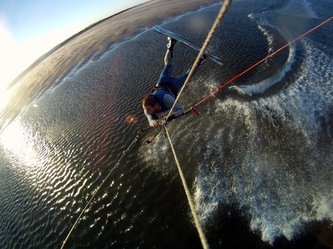 Its rocker also makes it great for springing powerfully off kickers or for a clean release when popping off the flat. The board does feel a little heavier than a regular Twintip when airborne, but when dailled into it its something you very soon get used to. As you'd expect of anything in the Hadlow range, its an exceptional unhooked performer - huge pop with the grip forcing the kite to slack hard, and truely exceptional grip on landings which are softened well by the board's rocker, channels and flex. I even felt that I rode out of tricks which I'd normally crash on as the rounded rails and grippy underside really seem to maximise your chances of riding away without a dunking! As someone who is fresh to riding with boots, I was impressed with how quickly I got to grips with the board - I was expecting to need to relearn each trick, but got the vast majority within a couple of attempts. 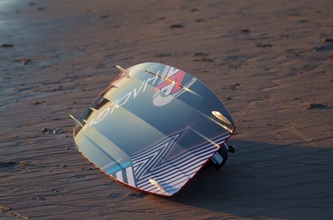 I didn't get the chance to remove the fins, but there is so much channeling under the board it's clear that there are going to be no issues riding it without, for hitting obstacles or just as a riding preference. I never thought I'd see a board which would so quickly change my mind about riding boots after being a straps advocate for many years. Its real standout features are the explosive pop and assured landings, but aside from that its a very user-friendly board with great upwind performance, stability and chop eating. 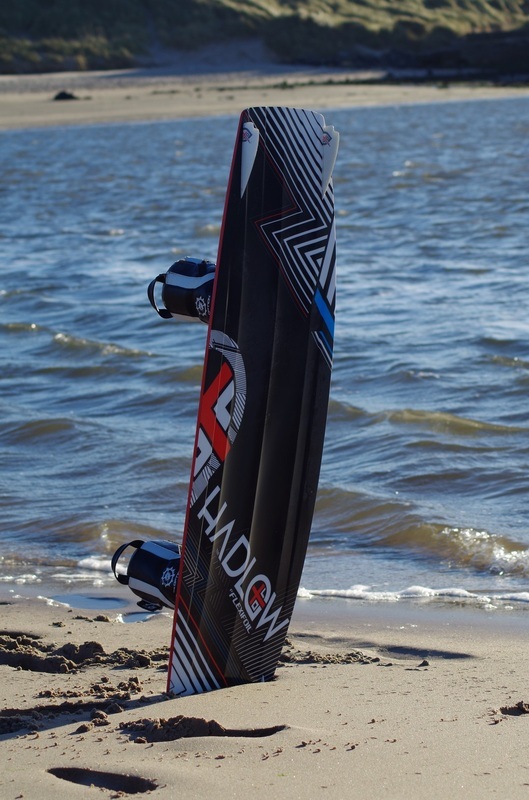 It makes it an ideal choice for anyone already into wakestyle in a big way, or a great board for freeriding in boots or a rider aspiring to make the transition between the two.